Put in your business details. For your Application Description, don't worry about being too detailed. 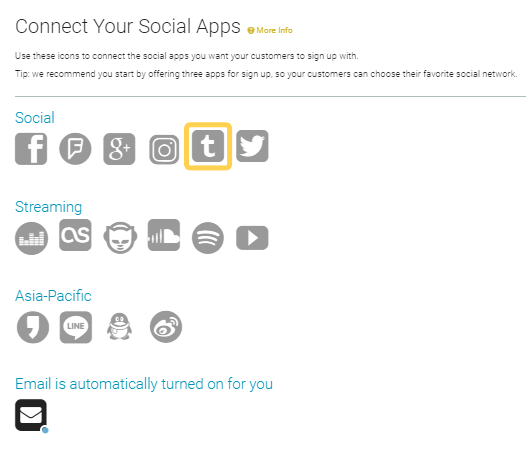 Something like "I'm creating an app to monitor my customers/fans across different social networks" should do. *If you're on a custom AE Enterprise plan you'll have a custom domain. Make sure to add it in front. You'll get a message saying you've been successful and your new app details will appear below. You'll see your OAuth Consumer Key. Click on the Show secret key link to see the secret key. Click on AE Connect from the AE header. You've connected Tumblr to AE. Or choose from the full list. 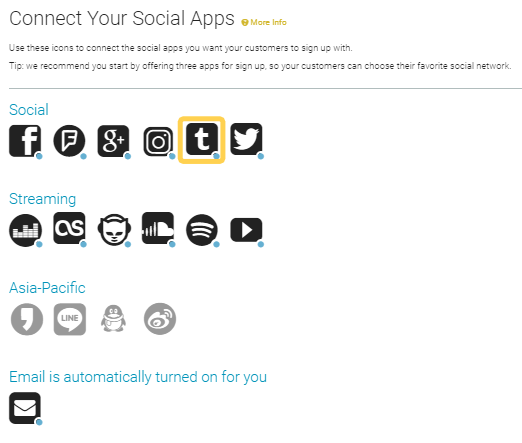 If you are ready, integrate AE Connect, our social login solution, into your website.